Nate Miller's Tabletop Games: Jägers on the paint table! Jägers on the paint table! I started painting my Jägers today. 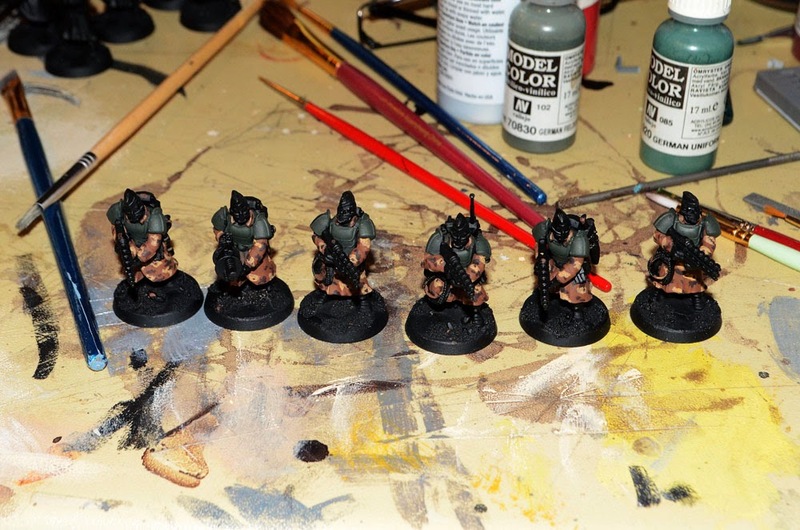 I used a WWII German camouflage pattern as inspiration for their coats and some German Camo Dark Green paint from Vallejo. I'm planning on painting their flat caps and Packs German Fieldgrey but most of the rest of their kit will be black. I'm pretty happy with the way they are progressing. Hopefully we will see more Wolfhounds in our campaign soon. Martian Troopers and Wolfhound Veteran finished! Martians and Wolfhounds on the paint table! Wolfhound Freikorps: Shocktrooper Squad Painted! Tanksgiving Update: 5 Vehicle Mix!